Driver of Modiin Illit bus and driver of private vehicle expected to be charged with involuntary manslaughter in deaths of two passengers. Prosecutors are preparing to indict two drivers involved in a fatal bus crash earlier this month which killed two residents of the haredi city of Modiin Illit. According to a report by Kan, investigators are expected to complete their probe into the fatal crash involving a bus from Modiin Illit on Route 443 within the next few days. Authorities reportedly made a major breakthrough in the investigation, which is expected to be turned over to prosecutors this week, and will likely lead to the indictment of both the driver of the bus involved in the crash, and the driver of a private vehicle which pulled over to the side of the road just in front of the bus. 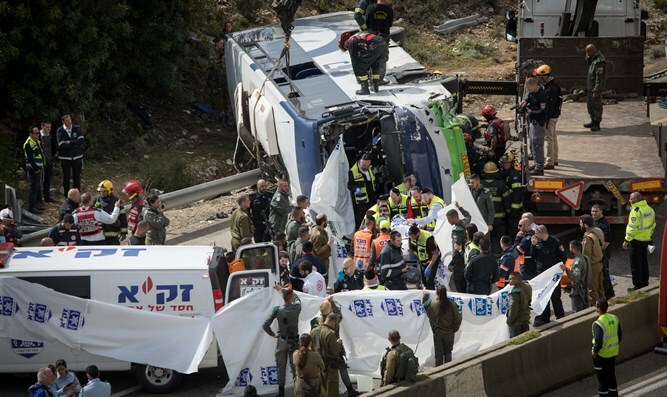 The crash, which occurred on February 10th, took place on the Jerusalem-bound Route 443, when a bus from the Kavim company’s 304 line with service from Modiin Illit to Jerusalem collided with a private car which had pulled over onto the side of the 443 by the central divider. The bus flipped over as a result of the collision, and skidded into the side rail. The side rail penetrated the side of the bus, injuring some of the passengers. Two women, both residents of Modiin Illit, were killed, with 41 others injured. Investigators found that the accident had occurred shortly after another, small accident was reported nearby on the Modiin-bound side of the 443. A private vehicle which had been driving in front of the ill-fated bus pulled over to the central divider to see if he could render assistance to the victims of the first accident. The bus, which was immediately behind the private vehicle, crashed into the private vehicle. The two drivers could potentially be charged with involuntary manslaughter, with police suspecting the driver of the private vehicle pulled over suddenly and parked his car in a dangerous an irresponsible way, while the driver of the bus is said to have been tailgating the private car, and was thus unable to avoid colliding with it when the private car pulled over.